I believe every new home plan should be reviewed by a licensed interior designer to avoid rooms that are not friendly to seating arrangements. Who’s better to review a plan for the purposes of space planning then a person who does it every day in their work? 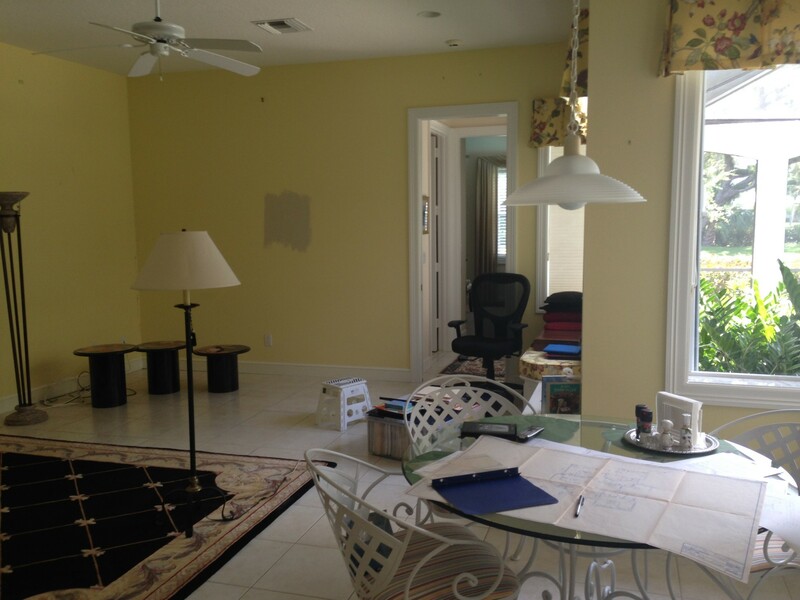 One day working in my office I received a call from a desperate homeowner, who had decided to redo their family room only to realize they needed help from a professional, due to the limitations, the size and shape of the room. When I arrived at the home I found a space left in “DIY” limbo. The first thing that grabbed my eye as “wrong” was the space in front of a beautiful glass window looking out onto the pool area, it was not being used. 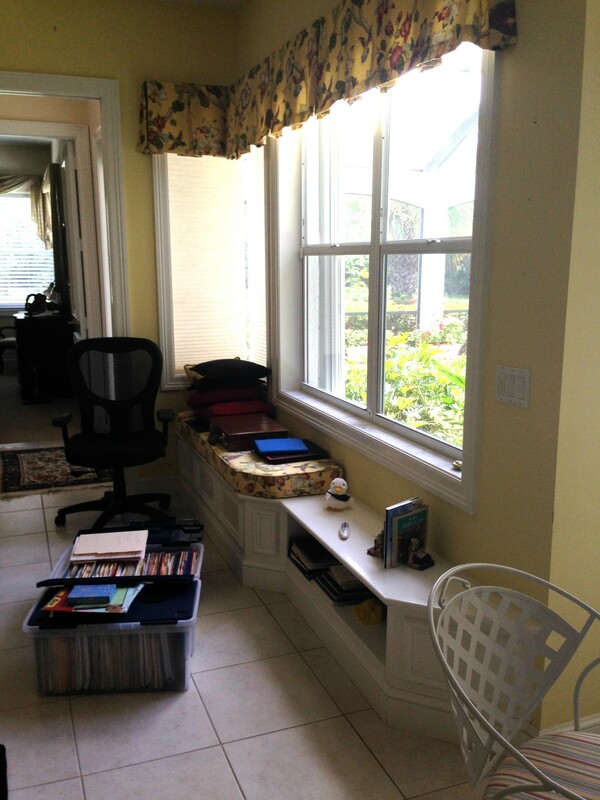 After interviewing my new clients on their needs, I determined the window space would make a great planning desk for the home owners. 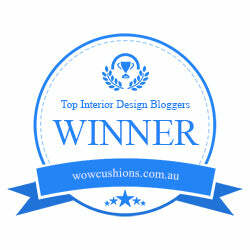 They had been working in a dark guest bedroom which didn’t offer any inspiration and caused plenty of disorganization. My thought was, what better spot to be inspired than in the family room surrounded by family and looking out at their gorgeous pool area. 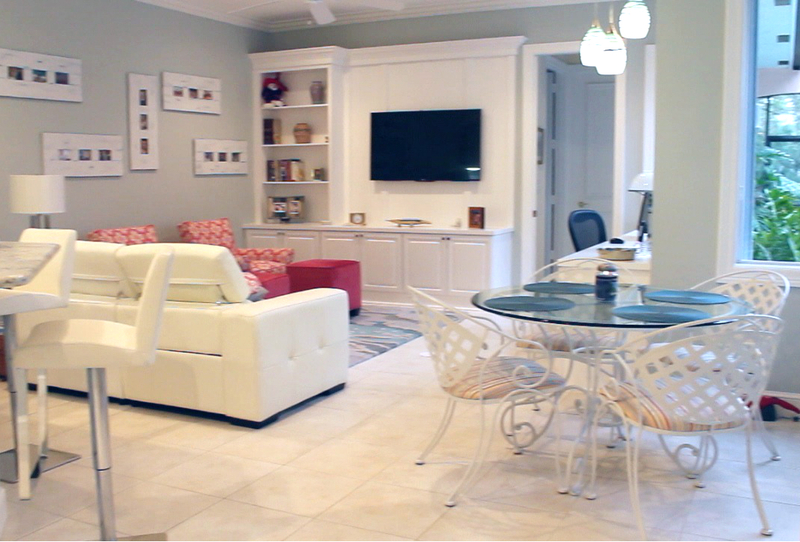 The challenge with the size of the family room was the long narrow shape, making it difficult to do a seating area conducive to socializing and watching TV. A professional designer should be able to offer you choices in your room design, which is how I approached this project. 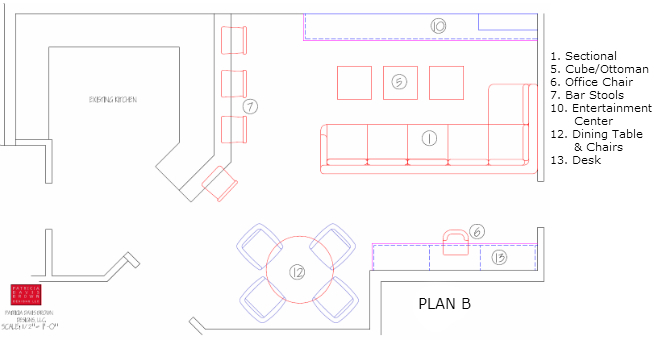 Plan “A” creates a wider seating area shorter in depth. 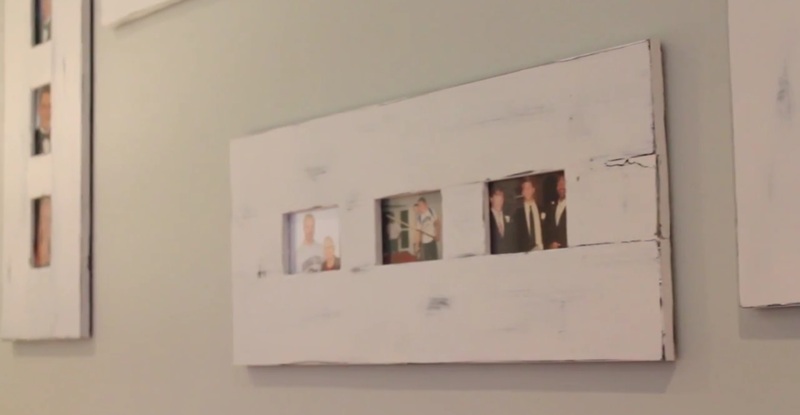 This places the entertainment center on the large wall as the focal point. This furniture layout offers a love seat and two separate chairs with end table and coffee table. Some people prefer separate occasional chairs due to everyone having different ergonomic needs and this offers a great solution. 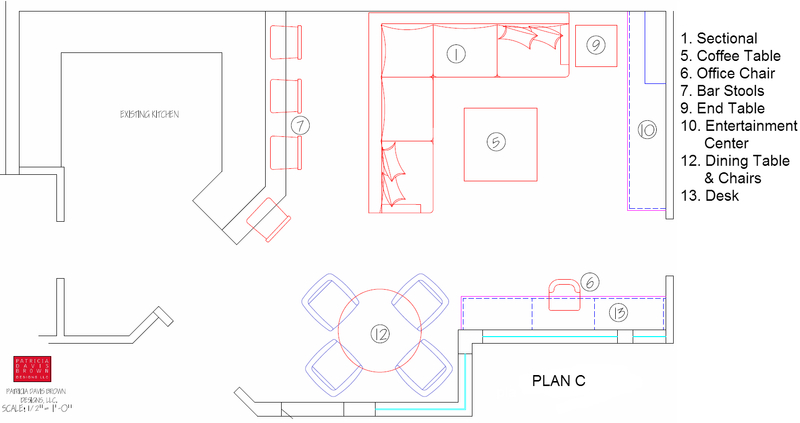 Plan “B” is showing the similar layout but using a sectional couch with cubes to put your feet up on and easily move around for the users comfort while viewing the TV. Both “A” and “B” plans offer more viewing opportunities for watching TV and less for looking out at the pool. Plan “C” and “D” offers a more versatile space. Both layouts offer two viewpoints, viewing the entertainment area or the outside pool. “C” design is shown with a sectional couch and is good for families with children that might want a cozier feel. Plan “D” is the plan that was chosen and offers a reclining love seat to sit in while viewing the TV. 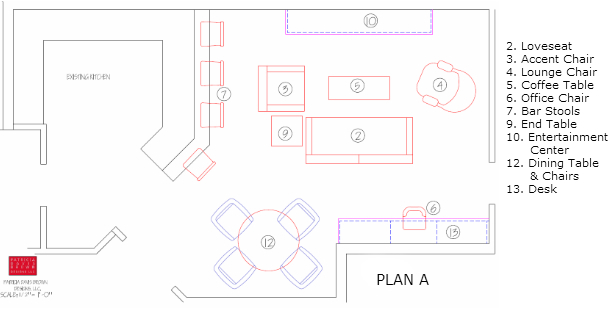 In both “C” and “D” plan the entertainment center is shown on the short wall and calls for the design of an asymmetric TV placement to be viewed from the love seat. The individual chairs offer a view of the pool area along with creating a socially inviting seating arrangement. The clients felt this design fit all their needs.